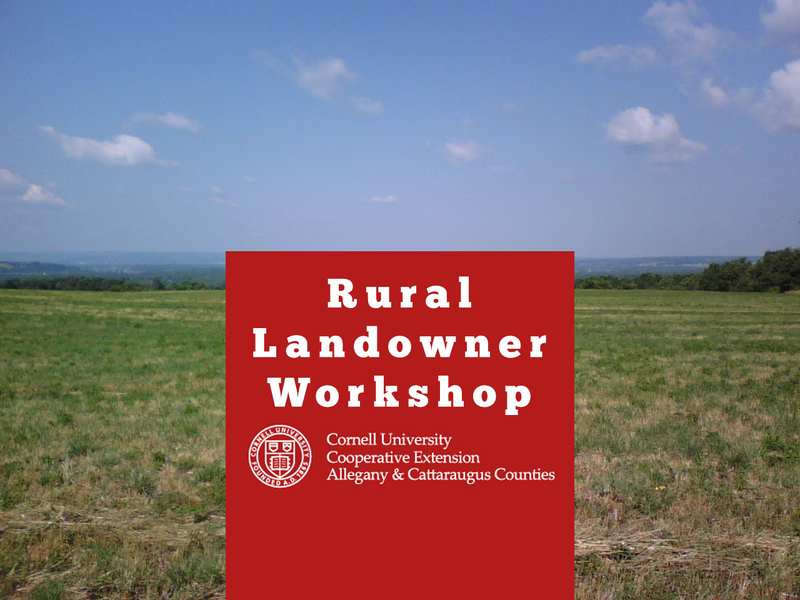 On Saturday, March 1, 2014 Cornell University Cooperative Extension will be sponsoring the 22nd Annual Rural Landowner Workshop. The program will begin at 9:00 AM and end at 3:00 PM. There will be an open session on the Ecology of Alaska followed by three concurrent sessions with four classes per session and you must choose one class per session. The Rural Landowner Workshop is a regional program involving several agencies that provide educational information and outreach to landowners. Presenters are brought in from both private and public sectors to provide participants with up-to-date information. Some of this year’s topic highlights are: Managing Invasive Species, Forest Mushroom Cultivation, Woodland Legacy Planning, Fishers, Bird Habitat, Pond Site Inventory, Solar Electric Systems and many more. New this year, there are up to 3 DEC Recertification credits available in Category 2, 3a, and 9. The program will be held at Pioneer Central School located on County Line Road in Yorkshire, NY. NYS-DEC Fisher Monitoring Study - Ken Baginski, Wildlife Biologist. DEC is conducting a 3 year fisher monitoring study across the southern tier of NY to obtain estimates of occupancy and potential estimates of the population of fisher in an area that has seen recent increases in fisher observations but is outside the traditional fisher range. Starting in 2013 DEC has deployed baited camera traps to detect the presence of fisher and is getting some impressive results. Biomonitoring for Environmental Quality - Dr. Chris Pennuto, Biology Dept. & Gt. Lakes Research Center, Buffalo State College. Bugs, Algae, and Slime, Oh my! What’s living in your pond or stream can tell you a lot about your land. Biomonitoring provides a framework for assessing environmental quality, especially in aquatic habitats like lakes, wetlands, or streams. This presentation will introduce the concept of biomonitoring and suggest ways that individual landowners can assist in monitoring efforts, both for understanding the quality of the environment and serving as a surveillance network for aquatic invasive species. Small Wind Electric Systems - Consumer Education - Roy Butler, NABCEP Certified Solar PV Installer®, NYSERDA eligible PV & wind installer, Four Winds Renewable Energy, LLC. This workshop will cover various aspects of grid-tie and off-grid small wind electric systems. Some of the topics to be covered will be NYSERDA incentives, wind site evaluation, tower options, tower economics, wind turbine selection and system performance issues. Securing Your Land for Future Generations - Dave Bojanowski, Land Conservationist, Genesee Valley Conservancy. Have you ever thought about what will happen to your land in the future? Whether you’re interested in securing a family legacy or protecting a unique and valuable natural landscape, a conservation easement may be an option for the rural landowner to secure lands for future generations. This workshop will explore the concepts of how conservation easements work and the benefits they may provide to the landowner. Tax deductions and a variety of property rights, including hunting, timber, mineral, and development will be discussed. LUNCH 11:30 a.m. – 12:45p.m. EAB/Invasives update for NYS - Mark Whitmore, Dept. of Natural Resources, Cornell University. State-regulated Wetlands: Information for Landowners - Anne Rothrock, NYSDEC Senior Wildlife Biologist Freshwater Wetlands Program. Do you have a regulated wetland on your property? The Freshwater Wetlands Act was passed by the New York State Legislature in 1975 in response to uncontrolled losses of wetlands and problems resulting from those losses. As a result, wetlands meeting certain criteria are regulated on both private and public land. This presentation will explain why wetlands are important and what landowners need to know about how Article 24 of the Environmental Conservation Law may apply to them. Solar Electric (PV) Systems-A Basic Overview-Roy Butler, Four Winds Renewable Energy, LLC. This workshop will cover the basics of grid-tie and off-grid photovoltaic systems. Roy will discuss the installation process from site evaluation, NYSERDA incentives, system economics and sizing, installation and the grid interconnection process. The Importance of Slash to the Future of Your Forest. Devin McMahon, Cornell Univ. Senior and Gary Goff, Cornell Cooperative Extension. Beauty is truly “in the eye of the beholder” and for many reasons the left over slash from a firewood or timber harvest is a beautiful thing! Forest owners should consider the consequences of selling off too many tops in an attempt to make a few extra dollars or to “neaten up” a logging job. Logging slash plays a key role in protecting seedlings from deer browsing. Forest Mushroom Cultivation-Don Gasiewicz,Owner/Operator Toad Song Mushrooms, CCE Wyoming County. Utilize low value and cull trees to grow gourmet mushrooms. Whether for home consumption orprofit, small diameter trees can be used as a low cost substrate, while producing high value mushrooms. Learn the types of mushrooms you can grow, which tree species you can use for mushrooms, inoculation techniques,site considerations, fruiting your logs, and some simple marketing strategies. Ecology and Management of American Beech.-Peter J. Smallidge, NYS Extension Forester Cornell University. Good forestry makes good bird habitat: how to balance the needs of many species of birds on your lands and the surrounding landscape-Loren Smith, Buffalo Audubon. Learn how to maintain and/or encourage birds and other wildlife on your property as you take care of your land for future generations. We will discuss how forest conditions affect birds, enhancing wildlife habitat in your forest, and how your property and habitatfits into the bigger landscape. Connecting Partners Around Emerging Invasive Species Issues: From Taskforces to the Web-based Tooli-MapInvasives”-Dr. Chris Pennuto,Biology Dept. & Gt. Lakes Research Center, Buffalo State Collegeand Sharon Bachman, CCE Erie County. Addressing invasive species proves most effective when done in community. Find out about the role that Task forces play locally in reducing impacts of species like Emerald Ash Borer and hydrilla, and how landowners can connect with and offer input tothese groups. Input from rurallandowners is also important in identifying where invasive species infestations are located. Put your datapoint(s) on the map. Learn how you can be part of a statewide effort to map invasive species using the i-MapInvasives web-based tool. Love Your Land? Make a Plan. Woodland Legacy Planning.-Gary Goff, Cornell Cooperative Extension. Most current forest owners plan to leave their woodland to their heirs and would like to see their stewardship efforts continue into the future. Yet very few owners have a solid plan in place and most have nothad a serious discussion on the topic with their heirs. This interactive presentation will give you some good ideas on how to get the discussion started and provide a host of excellent resources to help make the process of ownership transfer focused and smooth. Pond Site Inventory & Evaluation–Brain Davis, Director Cattaraugus County Soil & Water Conservation District. This presentation describes various site characteristics that need to be evaluated toproperly develop a pond site. They include planned uses for the pond, limitations due to physical features,along withsafety and legal considerations.